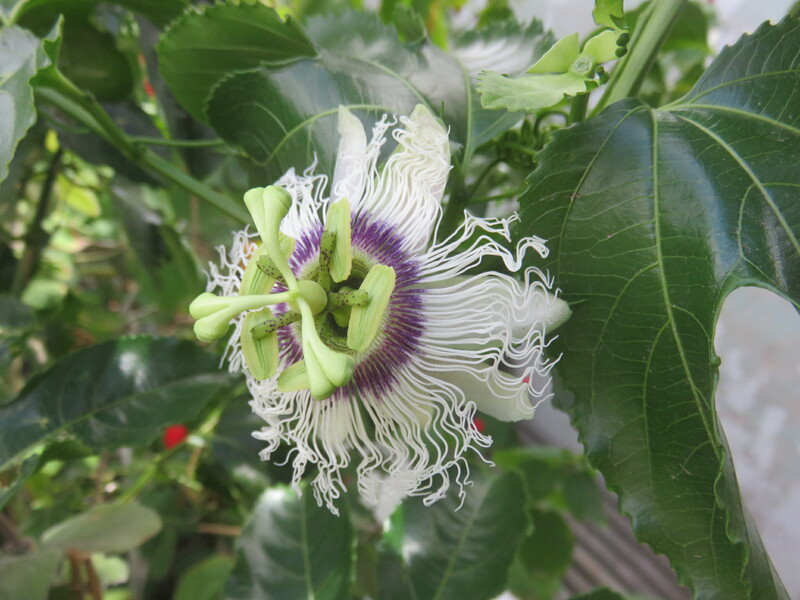 Grow passion fruit and be treated to this gorgeous flower. In late 2017 I came to grow passion fruit from seed because of the prolific vine in a friend's garden. His vine bears heavily and he was able to give us a small basket full of fruit. By the time I got to paying them attention the fruit were no longer edible, so they were used for propagation instead. The granadilla or passion fruit is easy to grow from seed, and the fruit makes a delicious ingredient in fruit salads and cold summer drinks, jellies and many other summery recipes. Passion fruit grow well from fresh seed like this. 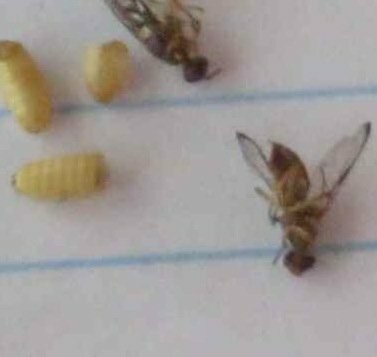 I scooped out the fruit pulp full of seeds and fermented it for 10 days to separate the pulp and seeds. 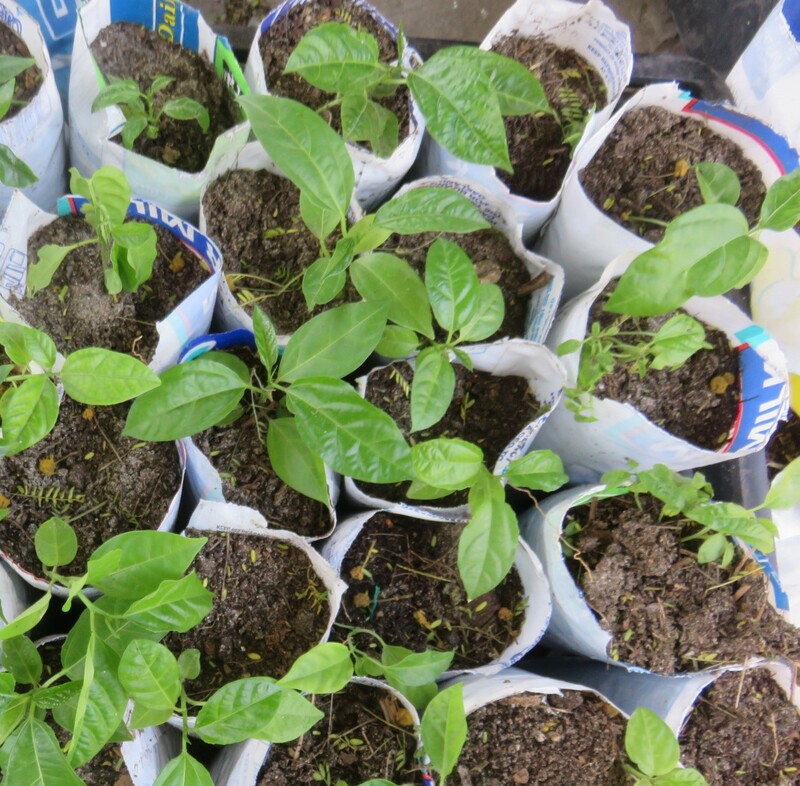 Then I washed them and planted them 8mm (half an inch) deep in 10cm (4 inch) deep polystyrene trays made of old fish packaging boxes.The seeds were wet when I planted them, so it may help hydrating them in water before planting if your seeds are dry. The weather was warm, from our spring to midsummer, in which average day time temperatures climb from 21 in September to 27 degrees C in December (70 - 81 F). 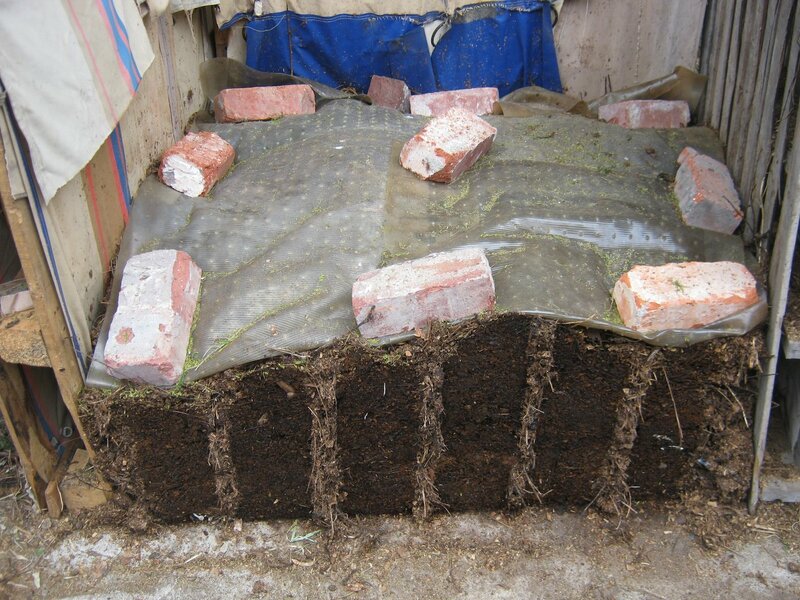 You could try germinating them indoors if the weather is colder. Within two months the granadilla vines had come up. I had a lot of unlabeled seedling trays and I only identified them when they were quite large, as the young leaves are entire and not divided into three parts, and they don't have tendrils or a tall vine like growth at first. 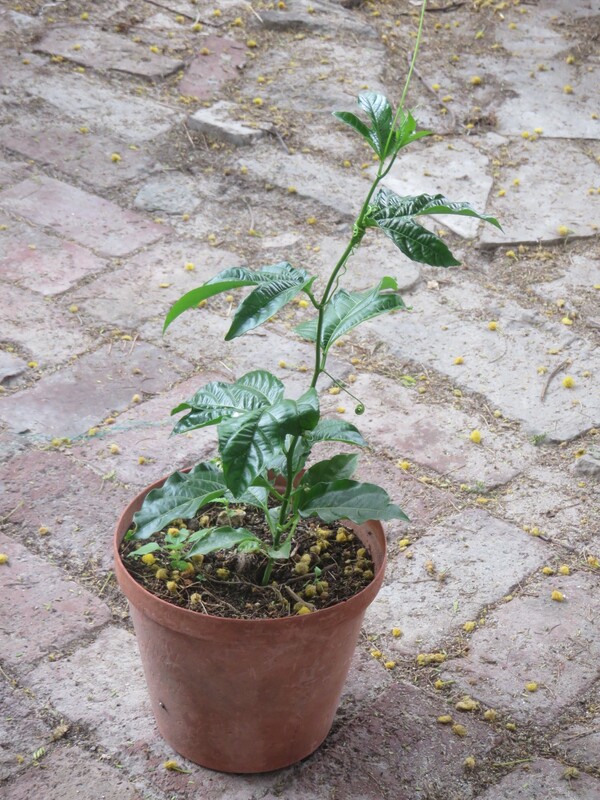 The young leaves are glossy, roughly elliptic in shape with smooth margins. 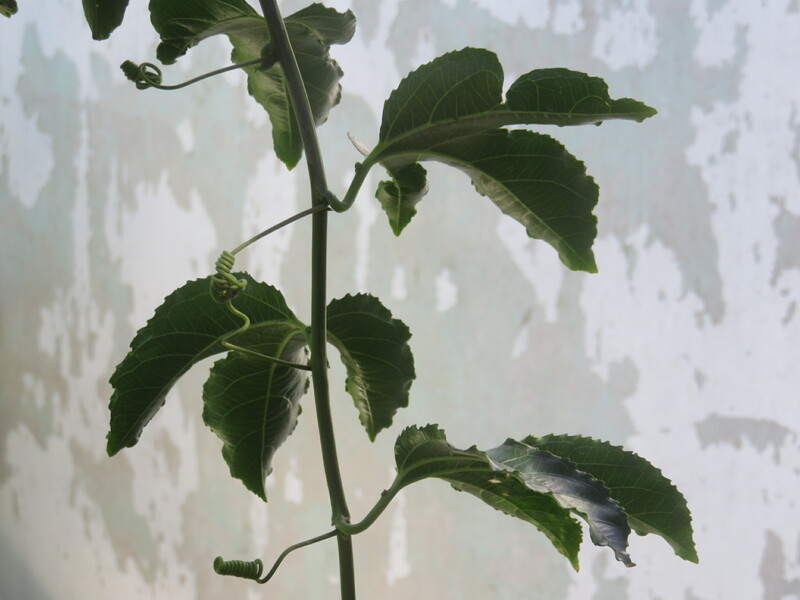 The granadilla vines that I raised grew rapidly to about a height of 50cm (20 inches) and then remained quite static as they became root bound in their containers. After planting out in the garden they needed really strong snail protection to make it. 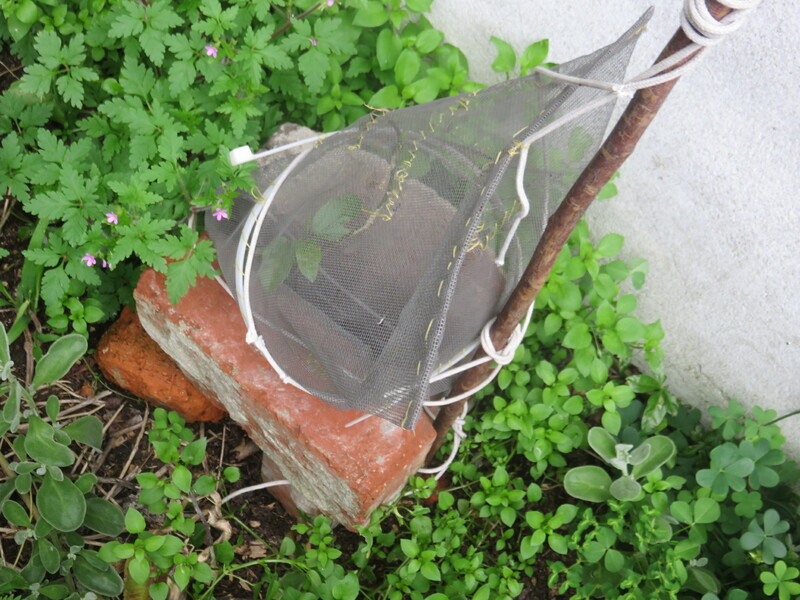 When the first commercial vine was gnawed back to only half a leaf, I covered it in a protective tube made of mosquito net with the bottom edge buried in the ground and the top edge sewed closed. After recovering from this insult the vine got going and eighteen months later is covering an area of about 16 square meters (19 square yards). 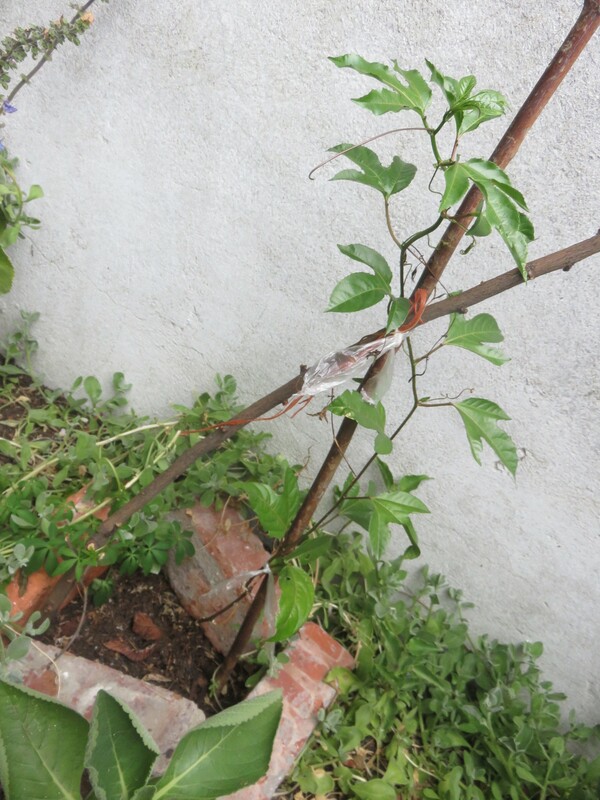 Besides a large commercially bought granadilla vine, I have two other vines grown from seed of about four meters squared (5 square yards) coverage each which I hope increase the chances of having a good bearer, and three others coming up, which are still quite small. I think I have left the ones grown from seed too long in their pots, and they may never really get large. This year I will raise a second generation from seed and hopefully keep better tabs on plant growth, germination times and repotting. Everyone knows how delicious passion fruit is. 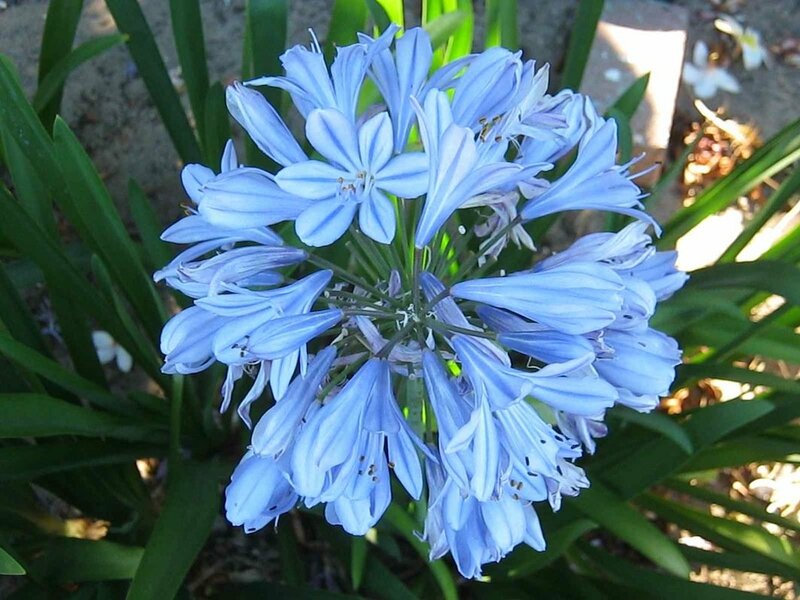 We've already mentioned how easy it is to grow, and hardy plants are needed in a drought resistant garden. Contrary to popular lore, in my experience when you grow passion fruit from seed they bear better than commercially bought vines. Perhaps it is just luck. The vines grown from fruit from my friend's garden vine are bearing, whereas the commercial shop-bought vine I acquired, at about this time, is massive, flowers profusely but never produces fruit. Perhaps it is the self-sterile yellow type of fruit. My friend's vine was a purple fruited vine, which is self pollinating. Then again, it may be nurture rather than nature. The big vine, of commercial stock, that has not fruited, is growing in an ancient worm bed, and was watered daily. 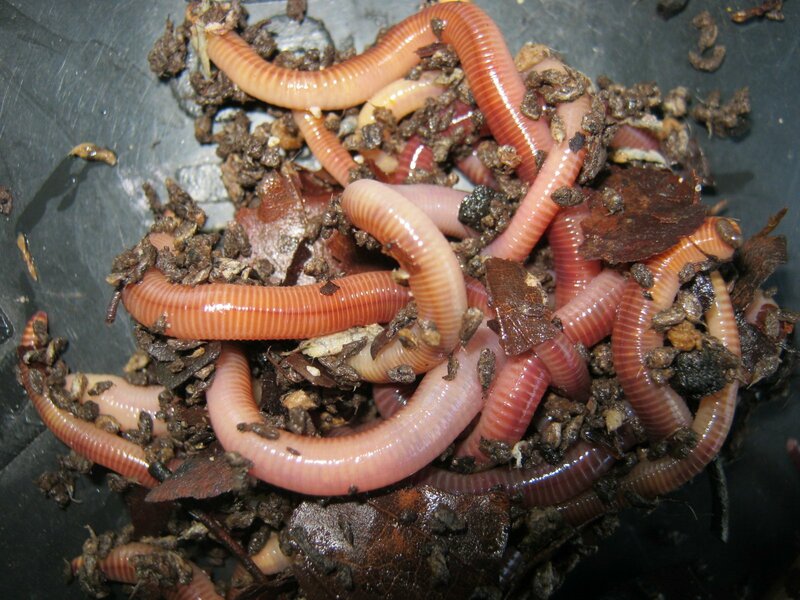 The vine that is bearing well grows in nutrient poor sand that has never been used as a worm bed, but is close to the standpipes of the fish pond and gets some nutrient rich water when the pond is flushed once a fortnight. 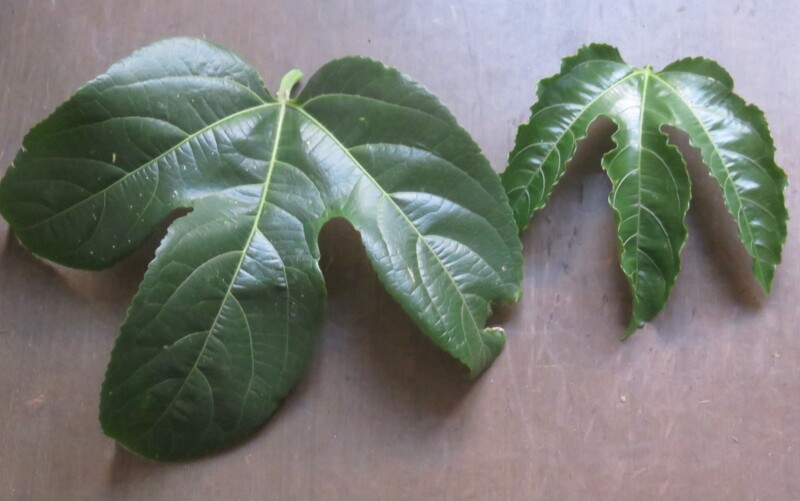 The appearance of their average leaf size and form and the more subtle difference in flower form can be seen below. The large vine is on the left, and the fruitful one on the right. The commercial vine on the left does have the pattern of vigorous vegetative growth due to oversupply of nitrogen. This tends to impact negatively on fruit formation. Left: bought vine, no fruit. Right: grown from seed, bears copiously. The granadilla vine is very lush and attractive, and soon developed an ecosystem of its own in one corner of the garden, a special spot requiring very little irrigation once established. 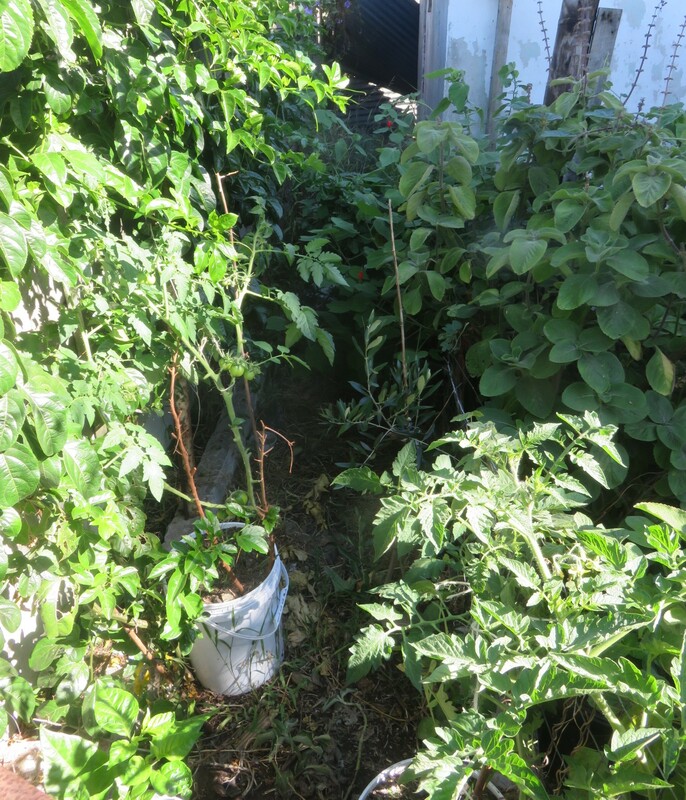 Growing granadilla vines also appeals to the gardener building a productive food garden, as it is a fruiting vine, and in urban spaces we often have more vertical than horizontal space in the garden. My perimeter walls are about 115 meters squared in vertical area, and the house 120 square meters, whereas the back garden's horizontal ground space is only 100 meters squared. The vine soon covered a concrete wall and created a protected ecosystem in this corner, where all plants require less irrigation. The bought vine spreads from left of the tree through to the vertical posts on the right, flanked by small home grown vines, like the one on the vertical posts. Thus, if we use our vertical space productively we can triple the growing area of the garden that harvests the sun's energy and turns it to food. 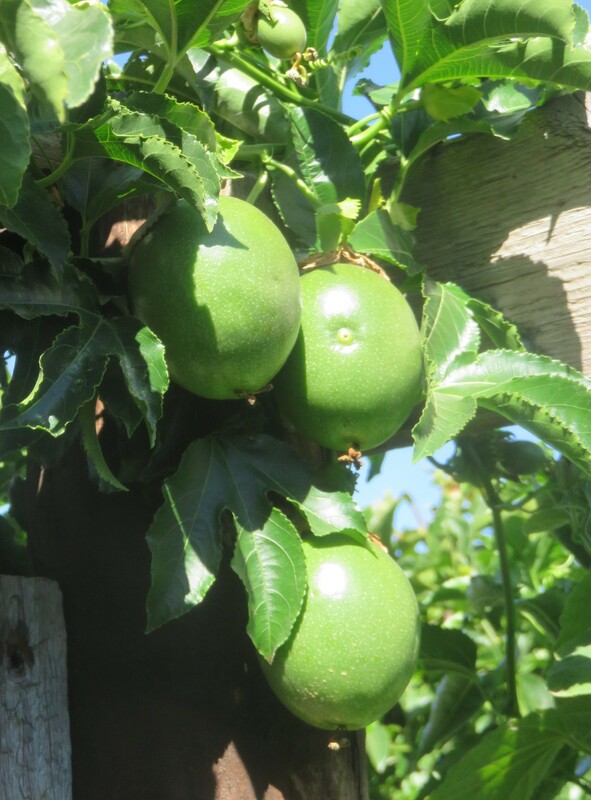 This is a good reason to grow passion fruit, and also to cover the garden fences and house walls with grapes, hops, melons, beans and cucurbits with edible leaves, kiwis, edible roses and climbing spinach. I choose perennial food plants whenever possible, as they are better for soil conservation and nutritional content. Have a look at my justifications on the page about perennial food plants. However there is another reason to grow passion fruit. 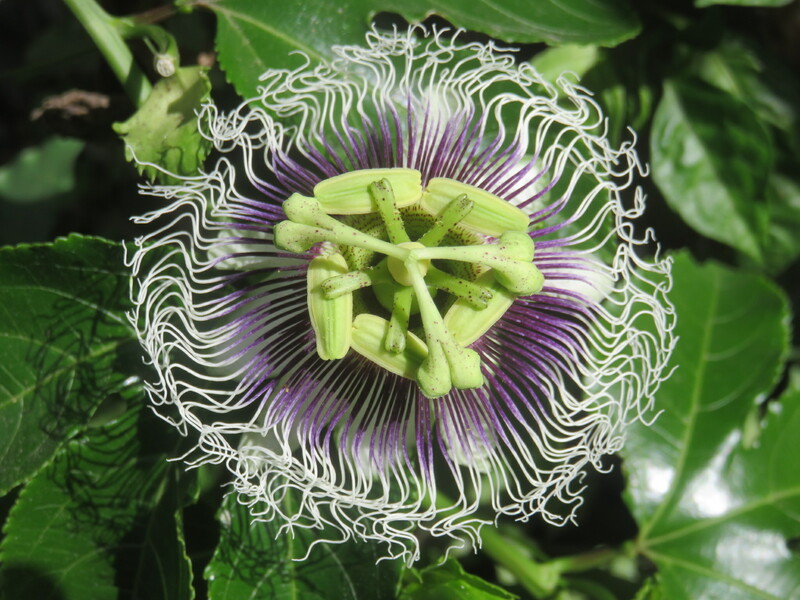 Passiflora is also a medicinal herb that is reputed to help with calming the mind and sleep, though this is denied by the FDA. With today's stressful lifestyles, and given the known degenerative effects of stress on the body, we all have need of as many different calming herbs as possible to use in a crisis. Spreading the medicinal load over many different herbs in sequence reduces the potential toxic effect or habituation that can occur when using only one type. 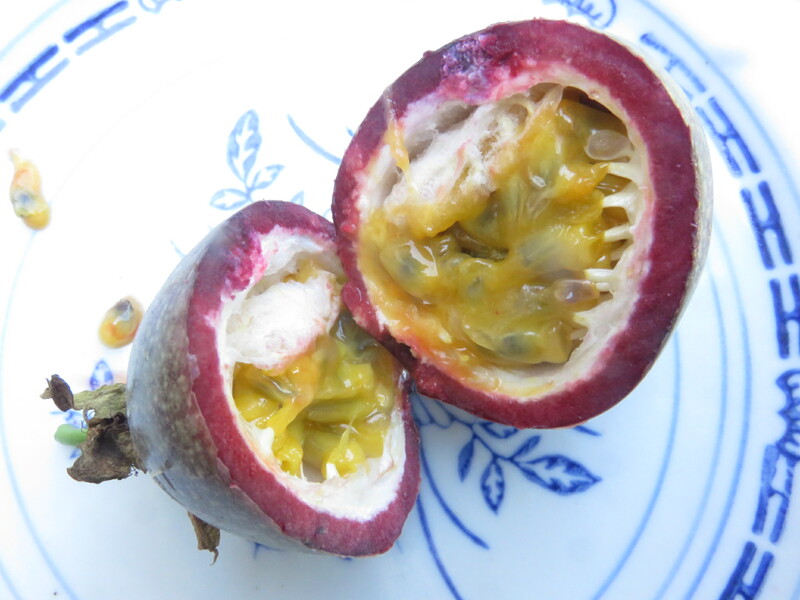 My very first impulse to grow passion fruit was to use it as a medicine, during a very stressful period of life. 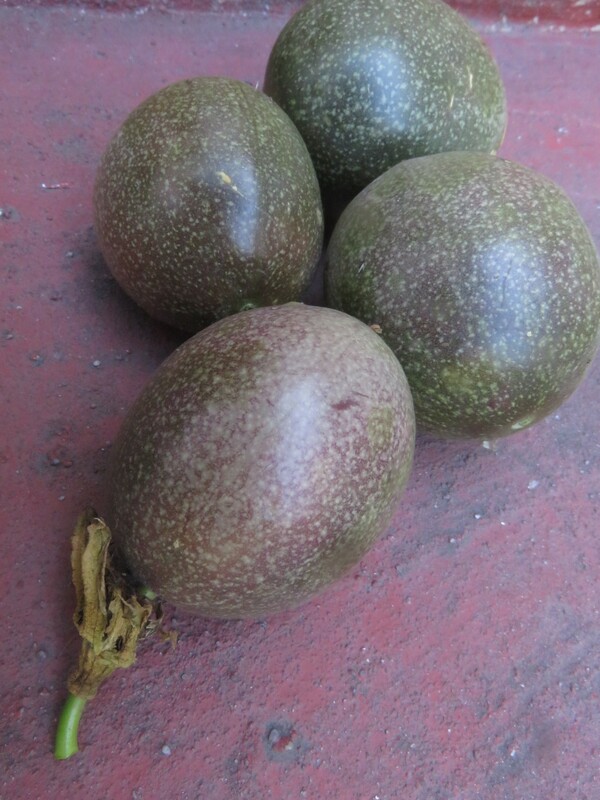 Like many other fabulous perennial food plants, the passion fruit originated in Amazonian Brazil. 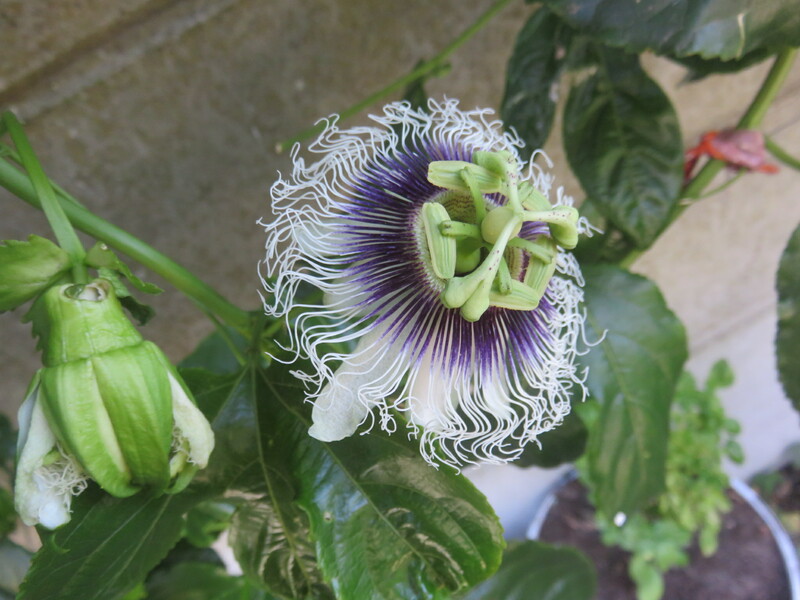 The early Jesuit missionaries, when they first saw the granadilla flower, interpreted it as a sign of Christ's passion, leading to the name it was given in English and other languages. Its symbolism was based on the numbers of flower parts, but the extraordinary beauty and nimbus or halo-like like quality of the circular arrangement must have first drawn attention to it. The ten petals stood for the ten faithful apostles, the three stigmas symbolized the three nails, the five anthers the five wounds, the spiky appearance of the center was for the crown of thorns, and the fine, wavy, thread like appendages of the corona represented whip lashes. The genus Passiflora has been very successful and diversified into 550 species, of splendid colours and forms, such as the gorgeous mauve Passiflora crenata, or maypop, which flourishes in the South Eastern United States. Most varieties of Passiflora originate in South and Central America, like Passiflora edulis, the common passion fruit. This colonial inheritance passed into Portugal's cuisine and its street markets sell an enormous diversity of passion fruit types.